The Boeing 777 is a long-range, wide-body, twin-engined airliner and is distinguished as being the first commercial aircraft to be designed entirely using computer software. 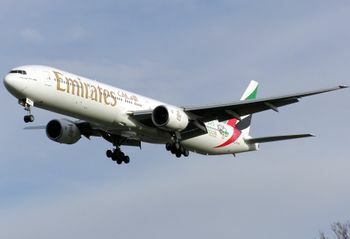 It first flew in 1994 and is one of the best selling wide-body aircraft available, with Emirates Airline operating over 80 of the type. The Boeing 777-200LR model holds the record for the longest distance flown by an unrefuelled commercial aircraft. This page lists all films that feature a variation of the Boeing 777. Pages in category "Boeing 777"
This page was last modified on 25 June 2017, at 17:58.